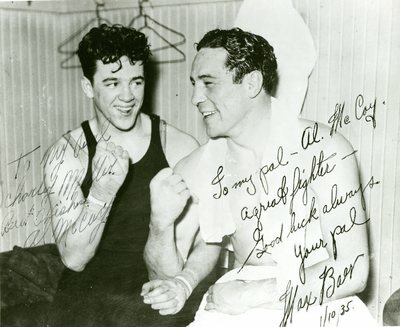 "Al McCoy and Max Baer "
A black and white photograph of boxers Al McCoy and Max Baer. The photo had originally been autographed, "To my pal Al McCoy. A great fighter - Good luck always, your pal, Max Baer 1/10/35." Also signed, "To my pal Charley Miller. Best wishes, Al McCoy." An additional copy of this photograph was signed for Abe Miller.